Some time ago we eagerly desired a wood shredder to grind branches and twigs. As you might know, our center pays for the rent and other expenses related to the house including food and utilities through our work program. We are often requested for pruning, cutting, and cleaning up after storms. One of the difficult aspects of this work includes the removal of branches and other debris. 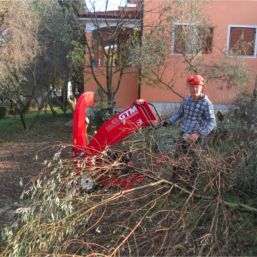 As a result, the students along with the staff of TC Slovenia began earnestly praying for a wood shredder that would save a lot of labor, strength, and money in carrying out the work. Amazingly, the Lord has provided! It is wonderful to watch how the Lord is interested in the details of our life, even when it goes for a wood shredder. It is another lesson for the men on how the right tools in life can make the world of difference in how things are done. As the weeks and months pass, our center is becoming tighter and tighter. We have a living capacity of 12, yet we currently have 13 students. The center is so full that the staff person, along with the director, sleeps on fold-up mattresses in the office. Unfortunately, for the first time in our history we could not express our hospitality to a perspective student since we do not have room on the floor for another mattress. This is a good problem, but we are challenged to pray and actively seek a larger place for our center. The center is truly a home of hope for anyone who enters it and acknowledges Jesus as his personal Savior. When Jesus takes up residence in a student then hope is awakened in the heart. We do not want to deny this privilege to another person. Therefore, please join us in prayer for a larger center where there will be room enough for anyone still captive to the pain and chains of addiction. We appreciate and value your prayers and financial support. Learn more about Teen Challenge Slovenia.